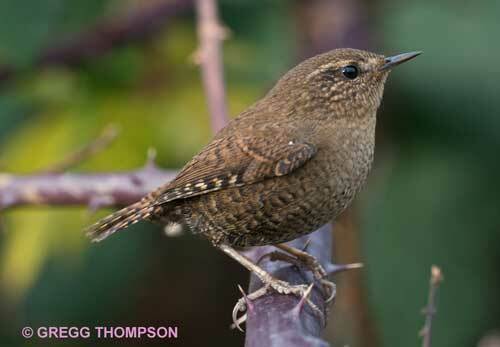 A Pacific Wren was holding forth in Kern’s Restoration Pond this morning. Pacific Wrens (formerly called Winter Wrens) are our smallest wren, hardly more than brown puffballs, with miniscule tails and big attitudes. They are uncommon at the Fill, so I was glad to hear we are hosting one now. This one was chattering to itself as it went about the serious business of finding food on a cold winter’s day. Kern’s Restoration Pond is one of my favorite places to set up my campstool and be with the birds. I like to roost just where the Loop Trail bows out and then bends gently west, near the snowberry bushes that Kern’s restoration ecology students have planted to replace invasive blackberries. It’s a quiet spot, sheltered from both the wind and the whoosh of the cars going across the floating bridge. The birds here seem to appreciate the quietness, too. They keep their singing and chipping low-voiced. All but the wren. She didn’t seem to care what anybody else thought. She had a comment to make on everything, and by golly, she was going to have her say. I call her a “female,” but really I have no idea what the bird’s gender was. With wrens, it’s hard for us humans to tell. But this bird reminded me so strongly of Mrs. Olswang that I couldn’t help but think of her as female. Mrs. Olswang was the most curmudgeonly person I ever knew. She lived at the Caroline Kline-Galland Home, a Jewish nursing home down in Seward Park. I met her when I was in grade school. I had gone to the home one day to meet my mother, who was the secretary there. As I walked up the drive, I saw an old woman with her skirt hiked up, wading in the duck pond in front of the building. Curious, I walked up to ask her what she was doing. But before I could open my mouth, she saw me and said, “Who do you think you are? You just frightened off the ducks, and now I can’t find where they’ve hidden their eggs.” Muttering Yiddish imprecations, she climbed out of the pond, put on her shoes, and clomped off. Mrs. Olswang was always muttering imprecations. Whenever I saw her in the hallways, her mouth was going a mile a minute, commenting unfavorably on the weather, her arthritis, the food, the fact that you couldn’t get flesh-colored stockings anymore (whatever color “flesh” was), and—sighting me—how the younger generation was a train wreck just waiting to happen. I waited for the storm to break over my head, but suddenly Mrs. Olswang grabbed me and gave me a big hug. Then with a “hrmph,” she unhooked her basket from the doorknob, went into her room, and slammed the door. I think I might have caught the glimmer of a smile on her face before the door banged shut. But it might have been just a trick of the light. This entry was posted in Uncategorized on January 22, 2011 by constancesidles.